“I” Exist Here and Now. Where are you? Two months have passed since our dearest beloved Shri Mahayogi returned to Kyoto, Japan. This span of two months is exactly the same as the precious amount of time we had to be in the physical presence of the Master, Shri Mahayogi, this summer. We miss him dearly… … … While he is in Kyoto, let us keep up our practice and go forward by applying what we have learned from the Master. Through doing it, may we feel Shri Mahayogi’s presence more and more and go closer to Oneness! This issue of Pranavadipa (Vol. 35) contains the transcription of the Satsangha that took place in New York on July 21, 2017. Those who have yet to met Shri Mahayogi can find great inspiration throughout this issue, some of the topics of which are described in our blog post, “Echo from The Cave 60.” (The Table of Contents for all issues of Pranavadipa are also always available on our website.) For those of us who attended the Satsangha that day, we will surely appreciate reading this Satsangha and reminding ourselves again and again about the teachings of Buddha, the practice of discrimination and the other precious teachings that we received through the grace of Shri Mahayogi that day. 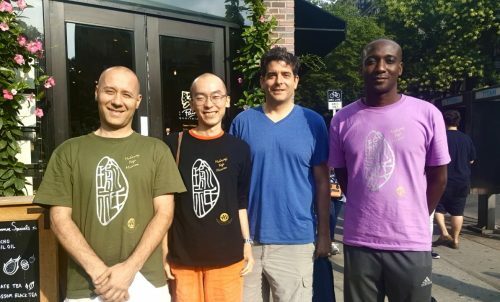 The Testimony this month is an article by our brother Gopala, who some of you may have had the opportunity to meet, as he visited NY from Kyoto during the month of July in order to learn directly from Shri Mahayogi. The title of his article is “The Existence and Guidance of the Guru: Reflecting on my Stay in New York City.” The contents of the “Testimonies from Actual Practitioners” bring different aspects of inspiration and hints for our practice, since these are about how practitioners apply the teachings in their everyday life as they aim for Satori. As we work on the publication of each issue of Pranavadipa, there is such a wealth of great content that we feel truly blessed, as this is our constant opportunity to learn more and more. With each time we read, we have the opportunity to find something more and to delve deeper. We hope that Pranavadipa will also support your own practice as you journey to find the true Self. This month we would also like to introduce an article written by one of our NY brothers, as he reflects on Shri Mahayogi’s visit this summer. There is much that we can learn from Shri Mahayogi’s visits to New York, and one of the ways this takes place is through being involved in the activities of the Mahayogi Yoga Mission. From cleaning the space to offering the mala, every moment spent with the Mission is an opportunity to learn and grow. In a meeting we had before class, our brother Gopala, who was visiting from Kyoto for one month, shared with us the importance of being prepared for Satsangha. I do not remember his exact words, but the message was that Satsangha are extremely valuable moments spent in the presence of our Guru and that it is extremely important that we always have questions which come from our direct experience of practice. 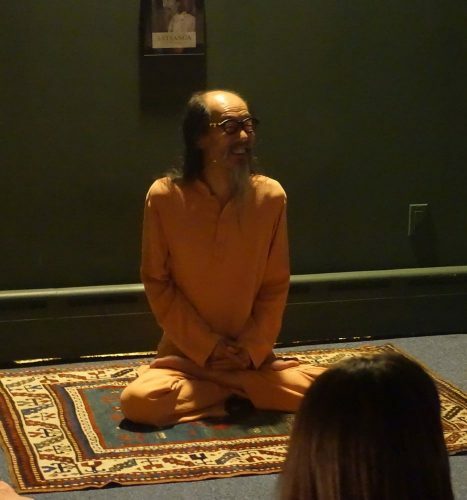 This was a great lesson that I learned during Shri Mahayog’s visit to New York this year. Apart from the set up, Anandamali had also asked me to demonstrate a few asana during the classes. 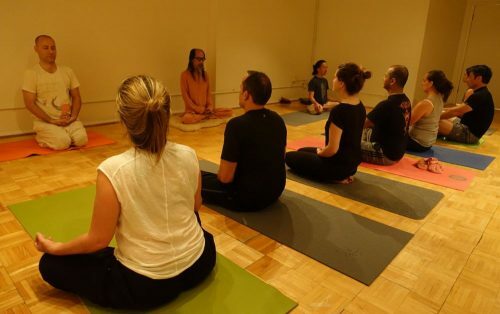 I found myself having to be aware of many things at the same time; performing the asana, listening to the direct instructions of Sadhya, who leads the class, and also being aware of the attendees in the room. This made me see the class from a very different perspective, unknown to me before, and showed me how important it is to take care of what our thoughts are doing each and every moment throughout the entire duration of the class. For example, once, while Sadhya was talking during the end of the class my mind wandered away, thinking of something completely unrelated. At one point, when my attention came back, I realized that for the duration of time that my mind had wandered, it took a piece of the class with it, and it felt almost as if in the middle of a game, when all the players are on a field, one decides to leave. At that moment, the team is no longer complete and everyone may lose as a result. So even a single thought can have a big impact on the energy of the space and on the other minds in the room. Now I am beginning to understand the importance and significance of all the minds involved in the class becoming one as they follow the direction of the person who is leading the class. For the last class with Shri Mahayogi, we had a good number of attendees whose native language is Romanian. Anandamali gave me the opportunity to be part of the leading staff for the first time during Shri Mahayogi’s class. I was asked to translate the asana instructions from English to Romanian for the new Romanian students. I was excited, so before class I started to think about the translation. But not too long after the class began, Anandamali let me know that I was moving too fast, in a restless kind of a way. Bringing my attention to my actions, I immediately noticed my tense body, which was the result of my mind being afraid of failure. This was again a valuable lesson that the body will follow the mind in everything we do and that it is more important to constantly be aware of the state of the mind. I was only focusing on the physical part of the activity so I did not realize that I was rushing through class trying to adjust the physical body of the practitioners, not paying attention to the finer details of practice, like their breathing. I moved too quickly and in a rough way, without putting care into the surroundings and the noise that comes as a result, creating a disruptive wave of energy that could have a direct effect on the level of concentration of the practitioners in the room and change the type of energy that had been created up until that point. 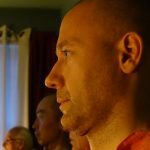 On my way to the first Satsangha this year I remember being very happy, but I also remember thinking that I did not have any questions. All of these situations made me notice my mind and the actions that came out of my state of mind. However, having not applied any of the teachings to these patterns of the mind, I only received a small mental satisfaction, which came from observing my mind and recognizing the incorrect thoughts. I guess at first my mind was just satisfied with the discoveries it made, but the fact that I didn’t have any questions also made me wonder if simply seeing the mind’s way of thinking is enough. Now I have begun to understand that I need to do much more than just look at my thoughts, because even though I may notice them, they do not change or go away. So although Shri Mahayogi is giving us so many blessings by showing us how the mind works, we are the ones who have to put the work and effort into applying the teachings so that we can grow and move past these patterns of the mind—otherwise they will remain unresolved. I know that now I will have to embark on an actual battle with my mind, and I am so thankful to Shri Mahayogi that not only he directs us into seeing concretely the shortcomings of the mind but that he actually gives us the teachings with which we can win over the endless river of false beliefs that constantly drag us into suffering from one incarnation to the other. Jai Satguru Shri Mahayogi Paramahansa! Any graphic, photographic, or written material in this site may not be published, reprinted, or copied without explicit permission from the Mahayogi Yoga Mission.